Every single guide on creating infographics tells you to look at your data to pick a topic or story point. For example, this very popular article on the Guardian starts out by saying you have to first organize your data, then pick the charts for them. Many other articles recommend similar advice – you should brainstorm with your data and select which data to use to create the “story”. Wrong! That is really bad advice. In fact, you should do the opposite – take your data and lock it up. Don’t look at it. Forget about your data for now. The #1 mistake most people make when they want to create infographics is to use their data as the starting point. No one cares about your data. Creating a great infographic is not about the data you have. It’s about answering questions and solving problems people have. Using your data to think about infographic stories will impede you in the selection of interesting topics and inevitably bias you towards what I call a “data for the sake of data infographic”. Allow me to illustrate with a simple example. A very large non-profit organization that is fighting against Malaria in Africa wants to create an infographic to get the word out about the dire effects of Malaria and how they are progressing against it. The data they have is what you would expect: baseline data on how terrible the disease is, the funds they have raised, the number of medication they provided to children, the number of doctors per population size, the number of Malaria cases/deaths and their locations and so on. Let’s say we do what most infographic guides recommend and we start with this data set and design our infographic. We might be tempted to create an infographic with the following storyline: Malaria kills a lot people, and our efforts against it is showing great results as evident in our numbers – the decrease in cases/deaths, the improvement in the number of doctors, better treatment, and perhaps some economic impact. Here’s what it would look like. It’s a very run of the mill type of infographic. Click on the image or here to see an bigger version of the infographic. This is not a bad infographic. But it’s not great. It’s your basic data-driven infographic. The problem is, this infographic tries too hard to fit all the great data the non-profit had collected and did not focus on what the potential audience would be interested in learning. 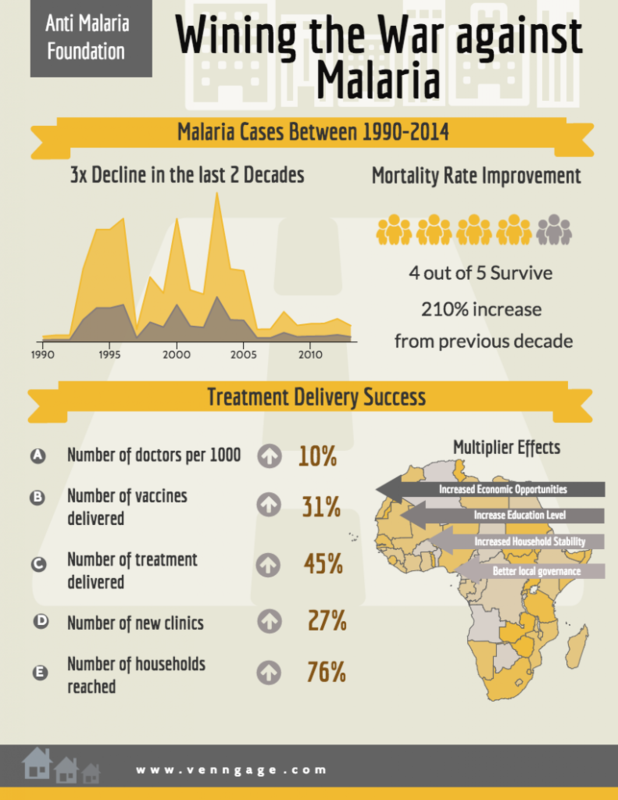 So, how would we create that infographic on Malaria? Fortunately, the talented people from the Gates Foundation did exactly that. They created an infographic entitled, “World’s Deadliest Animals”. I’ll let the infographic speak for itself. No where do you see any data on the Gates Foundation here. In fact, all the data they presented had nothing directly to do with the work of the Gates Foundation. But its impact is obvious. It’s an infographic that delivers an unexpected answer to a common question. It answers the question of why fighting Malaria is important using data that challenges conventional thinking and connects with the audience. It immediately elevates the importance of the Gates Foundation’s work against Malaria. Now that you’ve seen an example of why looking at your own data isn’t always the best place to start, what should you do? How do you pick a story for your infographic? Where do you start ? Start by observing and asking questions about the problem area you’re dealing with. Think of the impact you want to make, the problem you want to solve, or the question you want to answer. Then reframe it in an unconventional manner or present it in a different perspective to deliver a big impact. Example: What’s the best sleeping position for you? I’ll cover the actual techniques you can use to actually come up with questions or ideas in my next blog post. Stay tuned. As usual, if you have any questions or feedback, please leave a comment below.